TheBlueGuerilla: EXCLUSIVE: Incumbent Cooper Tops Tory Youth Poll. 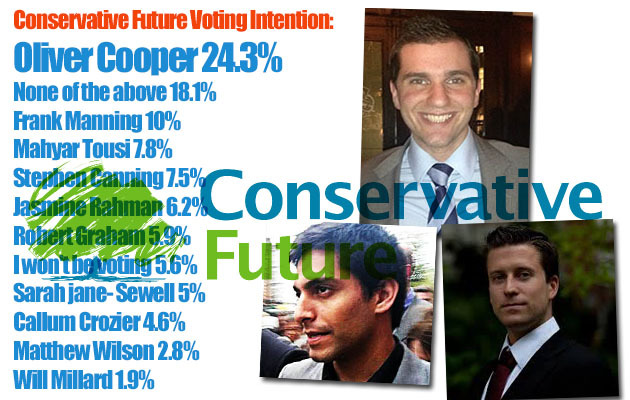 CONSERVATIVE FUTURE (CF) have taken part in the latest survey to gauge voting intention for this year's national elections with current Chairman Oliver Cooper sensationally topping the poll with a whopping 24.3%. Parliament Street communications guru Frank Manning came in 3rd spot with 10% after the 'None of the Above' (18.1%) option, with London CF'er Mahyar Tousi trailing in 4th spot on 7.8&%. It seems candidates have alot to do to gain votes from their fellow CF'ers. And let's not pretend that process has not already begun. I think that's a picture of the wrong Manning! Robert Graham for Chairman. The only man with any sense to pull CF around. Graham is the Boris Johnson of CF. Smart, intelligent, funny. I hope he runs. We need someone who has been a normal line member, someone who knows what needs to be done! There wasn't an option for 'would like to vote, but unlikely to receive a ballot'. Robert Graham is the only sane choice for any CF member. Grassroots experience and an excellent stomach for politics. Matthew Wilson? How many people have actually voted? 50? Poor Sarah! I love her!!!!!!!! I would be wary of Graham. As there is cases where he has harassed people in order for them to vote for him and be derogatory/ harsh to his opponents. I went to school with Graham, you should be very wary of him indeed. Robert Graham would be disastrous as CF Chairman. I think I'm in love with Sarah-Jane, honestly. She's amazing, she's be such an amazing Chair - more people than this have faith in her, it's a completely unscientific poll, means nothing. Keep up the good work, Sarah-Jane! I hear Cooper's girl (you know the one I mean, the libertarian) will declare her intention to stand any day now. She tends to do well in elections so it looks like Cooper will still be boss of cf whether he wins or not. Why wasn't Thorpe-Apps on this list? Jacob Young for CF chair! "Why wasn't Thorpe-Apps on this list?" Maybe because he's a sanctimonious prick and a wet to boot. If Crozier runs, he should have Jacob Young as his running partner. Now there's a winning pair!